Fall is coming up quickly once again and you are either nearing a new school semester or you've already started. Congratulations on one year closer to graduation! We know that everything can get a little stressful at times and a great way to relax is to travel, see new places, have some fun away from home and school. 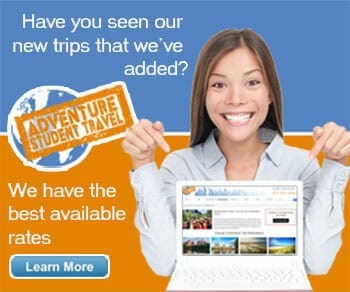 So, without further ado, here are some of the top affordable destinations for student travel in the fall months. As the fall months roll in and leaves begin to change, the Ozark Mountains light up in a spectacular display of color. While Lake of the Ozarks gears up for its fall tourism, head over to Branson where the fun never ends and live entertainment is a given. Branson's most popular theme park, Silver Dollar City, really starts going around the fall months when its 19th century mountain town theme amps up the atmosphere. Set amongst the changing trees on Ozark hillsides, the theme park features authentic demonstrations of candy making, glass blowing, and furniture making alongside the thrill rides like Thunderation and Wildfire. Make sure you check out the fall festivals including the Southern Gospel Picnic running August 27-September 7 and the National Harvest and Cowboy Festival from mid-September through the end of October. This beautiful southern belle is gorgeous year round but as the leaves begin to change, the old antebellum oaks that line every city square dangle and droop mossy tendrils of orange and red, depositing their leafy gems on the scenic roadways. The trees make a perfect backdrop for the Civil War era mansions spread throughout the supposedly haunted city, creating a spooky atmosphere especially after dark. Ghost tour companies charge full force into Halloween season and the fall months are a great time to walk the city streets with your own paranormal guide as the weather is still fair and warm. If you're not into ghosts, the city hosts a number of food festivals like the Savannah Bacon Festival, Oktoberfest, and a southern-Jewish food festival, Shalom Y'all. Savannah is also one of the most affordable large cities in the nation for student travel so check it out! Southern California's beautiful and expensive seaside city finds itself dropping hotel prices as the summer tourism season ends, ushering in the off season. While the city may not be affordable during the peak season, it sure changes its tune come August and September. The beautiful weather continues year round and makes Santa Barbara a gorgeous place to tour on foot or lounge by the ocean. Take an ecotour of the Channel Islands for a chance to see some wildlife and amazing sea caves cut into the California coast; sample some of the world famous restaurants featuring five star chefs; and participate in the weekend art crawls and other cultural events. Santa Barbara is also home to several free attractions including the Butterfly Beach, eight farmers markets, Old Mission Santa Barbara Rose Gardens, Stearns Wharf, and the waterfront among others. Fall ushers in Salt Lake City's lowest prices, agreeably cool weather, and absolutely stunning scenery. Drive along the canyons' rims and look down on the surrounding landscape covered in rolling colorful hills and changing foliage only seen in northern Utah. The city also brings in tourists and makes locals happy with the Utah State Fair every September and later the Oktoberfest at Snowbird which features authentic German music, food, and traditions. Better yet, Oktoberfest and many other festivals are free to wander through. If you want to see more scenery, take the Alpine Scenic Loop past the Timpanogos Cave National Monument and see the brilliant painting of alpine trees and aspen groves. This may be a small town compared to the others but it is a wonderful and affordable destination for students looking to escape. Go deep into the Great Smoky Mountains and let yourself become enveloped in the foliage, the scenery, and breathe in the cooling, pure mountain air to refresh your lungs. Feel revitalized to explore the Great Smoky Mountains National Park, one of the most visited in the country, and also tour Gatlinburg to see Ripley's Aquarium of the Smokies, one of the highest rated in the U.S., Old Gatlinburg Golf and Games, zip line courses, and the Gatlinburg Space Needle. Also come through during the many festivals to experience the Back Porch Concert Series, the Taste of Autumn food festival, or the Gatlinburg Craftsmen's Fair. While you probably won't find yourself taking a day trip to New York City from the Catskills, you won't be disappointed with its sophisticated rural atmosphere and seclusion for its number of artistic and cultural attractions. Set amid the Catskills Mountain range, this New York treasure features delicious organic meals from local farmers, live music events, and postcard perfect scenery during the fall months. A leader in agritourism, the Catskills is also a tourism leader in arts and culture, food and wine, camping, hiking, fishing, golf, and more. Have an amazing adventure with zip lining, white water rafting, mountain biking, or head into town to get a taste of the local flavor at art galleries, farmers markets, and more. Even though Portland, Maine is another excellent choice, its sister city on the opposite side of the country wows visitors year round for its fantastic array of attractions. The fall is even more surprising with the number of festivals, ecotourism boost from the changing trees, and the city's gardens being redesigned to suit the coming months. Drive a little outside of town to visit the Columbia River Gorge and see some of the country's most beautiful waterfalls, walk the gorgeous ravine trails, or even fly fish in the river. Bike along the city streets with the "Keep Portland Weird" crowd, take a look inside the Freakybuttrue Peculiarium museum, sample Portland personality at the Farmers Market or Powell's City of Books, and visit the International Rose Test Garden.